“At that time most of my work was based on creating a picture, a portrait with a particular lighting or set to tell a story. It was usually something I controlled. Now, with Dylan, it was catch-me-if-you-can.” Daniel Kramer’s Studio, New York City, January 1965. 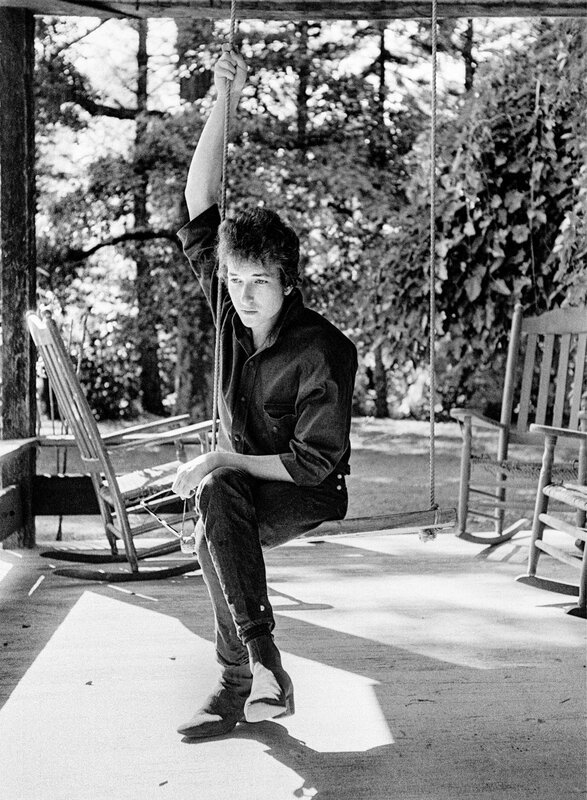 “Dylan is constantly looking for new things and new ideas, and when he finds them, he bends them into a shape that is uniquely his own.” Albert Grossman’s House, Woodstock, New York, August 27, 1964. 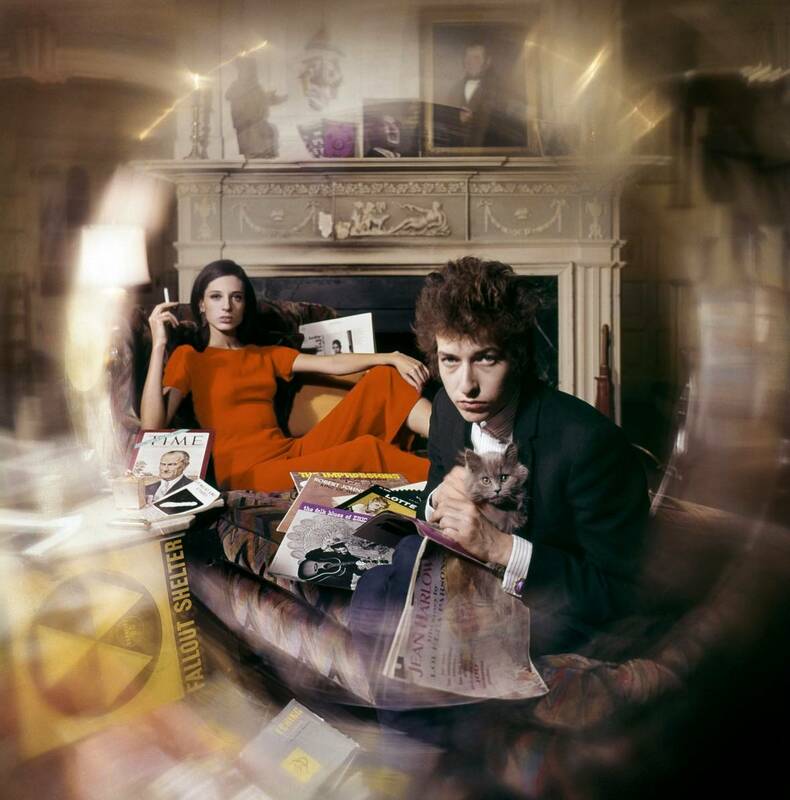 When photographer Daniel Kramer first met Bob Dylan, the 23-year-old singer was still widely unknown. He fidgeted in front of the camera, restless and uncomfortable. Yet over the course of a year and a day, all of that would change. From performing with Joan Baez to the legendary leap to electric sound, Kramer watched a quiet kid hanging out in Woodstock transform into the poet laureate of a generation. From 1964 to 1965, Kramer’s extrordinary access to Dylan on tour, in concert, and backstage, allowed for one of the most mesmerizing portfolios of any recording artist and a stunning document of Dylan on the cusp of superstardom. It all began in February 1964, when I happened to see a young performer on the popular Steve Allen variety TV show. That’s how this story begins. That’s when I saw Bob Dylan for the first time. Alone under a spotlight with only his guitar, Bob Dylan’s sound and forceful approach to his music immediately got my attention—then I heard his lyrics! He was singing about the corruption of justice: the wanton slaying of an aging hotel barmaid by a wealthy and influential guest at a Baltimore dinner party. A newspaper account of the woman’s murder was the truelife inspiration for “The Lonesome Death of Hattie Carroll,” which concludes by describing the woefully inadequate punishment for this public murder—a six-month sentence. Six months! It was poetry, poetry as good as any I had ever read, and I thought he was very brave to be saying such things on a widely seen popular mainstream TV show. 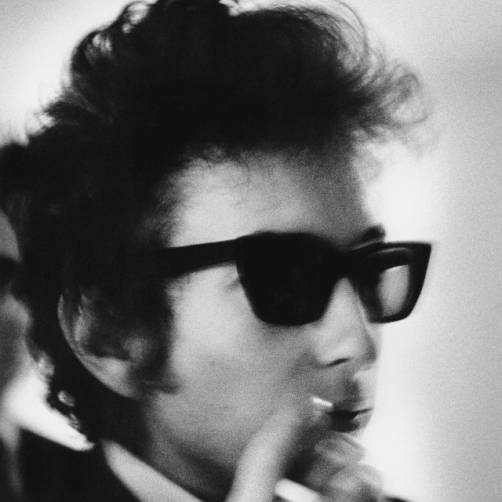 From time to time, Dylan added to the overall effect by leaving his lyric and playing the harmonica he wore in a wire holder around his neck. The music, the harmonica, and the guitar playing were strong and emphasized urgency and enabled me to feel the tragedy more (completely) deeply. He got me, although hearing his voice would have been enough to do that. It was the kind of sound I always liked. It reminded me of a voice from the hills. It was an old voice, it seemed craggy and weather-beaten, like a voice that had been left out in the rain and rusted. I attributed veracity to this voice, but what I didn’t know then is that Mr. Dylan is a singer of many voices. 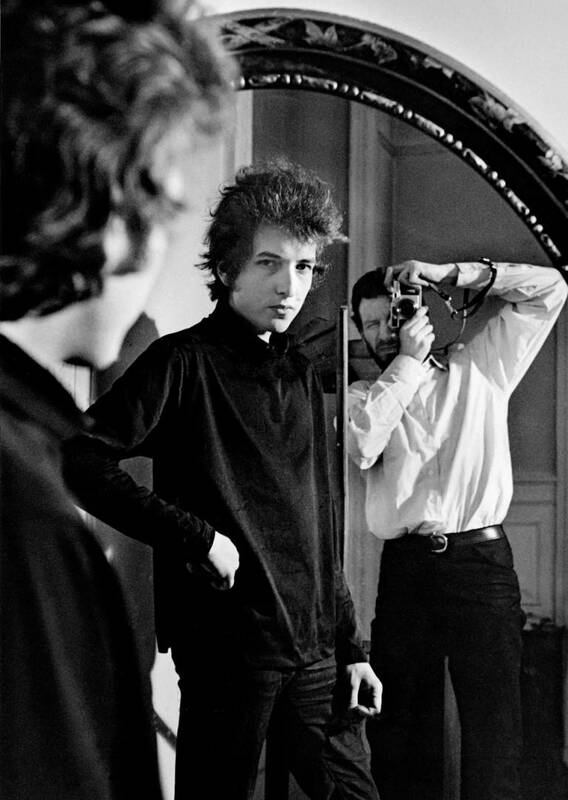 Later, after seeing Bob Dylan on the TV, I was still aware of his tapping on my shoulder. I was taken by what this man had done and how he had done it. With simple, basic tools he drove his message home, and certainly what he was saying about the corruption of justice was courageous. I sensed an important talent and thought that I should photograph him. I tracked down the name of Bob Dylan’s management company and made a phone call. Naturally I was told Mr. Dylan was not available. And so it went. I would call and they would say no. Eventually they asked me to put my request in writing—I did and it did me no good. 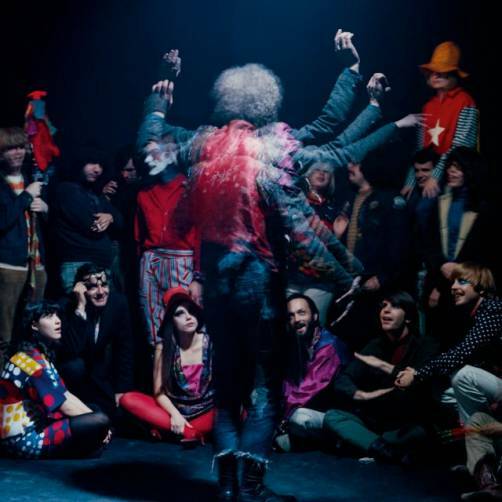 After months of calling I happened, one day, to call after business hours, and, as luck would have it, Albert Grossman, Bob Dylan’s manager, picked up the phone. By this time he knew why I was calling. Still, once again, I quickly explained that I wanted just one hour for a portrait session with his client and convinced him that I was a reasonable, completely sane, published, professional photographer. I was caught by surprise when his almost immediate answer was, “Okay, come up to Woodstock next Thursday. You can have an hour—call my secretary for details.” Just like that… just like that! 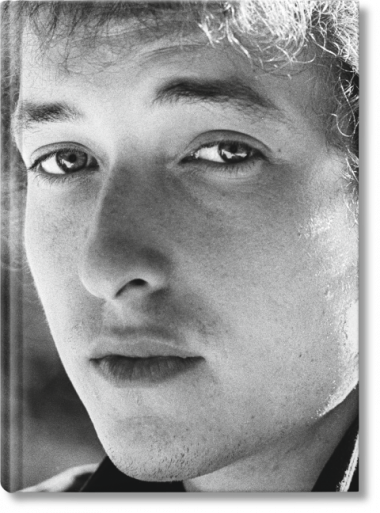 The day I met Bob Dylan started with a two-hour drive to Woodstock, New York. Just beyond the town, set off from the public road by an unmarked driveway, and concealed from view by an expanse of grounds covered with trees and heavy foliage, was the home of Albert Grossman. A sign posted on a tree along the driveway read: “IF YOU HAVE NOT TELEPHONED, YOU ARE TRESPASSING.” Here Dylan spent a good deal of his time when he was not on the road or in the city. More than a hideout, the large house was a peaceful retreat. There was a pool behind the house, and two smaller buildings were used as a garage and guesthouse. Everything was bright and still. Dylan was not there when I arrived, and I passed the time waiting at the pool. Then, the roar of a motorcycle in the driveway broke the quiet. It disappeared into the garage, and moments later a thin, gangly young man dressed in jeans, boots, and a rumpled work shirt walked toward me. Ringlets of hair protruded from under his motorcycle rider’s cap. His pale complexion and slight frame made him appear younger than his 23 years. As we greeted each other, we shook hands, and I was surprised at how gentle his handshake was (yet he was so strong when he performed). I’ve since decided it was his way of being polite and not giving me too much on our first meeting. Knowing him now, he was probably being cautious. We talked about what I wanted to do, and I told him I wanted to make a portrait and that it would not take too long. He invited me to do what I needed to do to get some pictures and disappeared into the house. I followed and found him sitting at a dining booth in the kitchen reading a newspaper. He turned the pages of the paper and never acknowledged my presence. This set the pace. Apparently he was not going to do anything, especially for my camera. It was not that he wasn’t cooperating. Actually, he was being reasonably available and in a short while he accepted that I would photograph and select my own pictures as long as they derived from what was happening. I thought that after a few sessions it would be over. I didn’t know that my association with him would become a long one. I didn’t know that I would photograph him many times for more than a year—that I would have the opportunity to document many facets of his professional life and to produce three important album covers, and so much more. 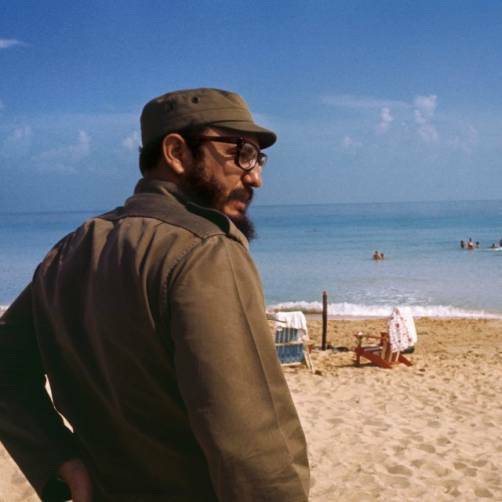 In the one year in which I photographed him, his music and his appearance changed radically. The single performer with his guitar and harmonica was now the leader of a band, requiring truckloads of equipment (as at his now famous Forest Hills concert in 1965). 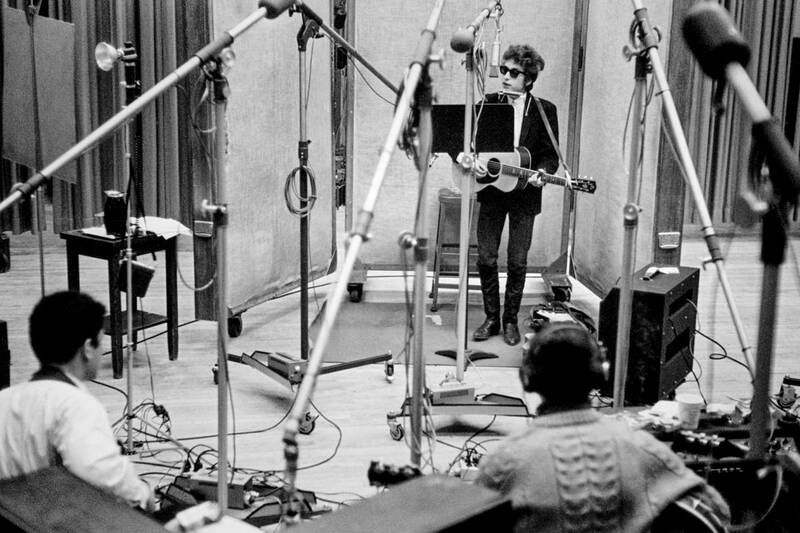 He also went electric—not at the Newport Folk Festival, and not at Forest Hills, but, as far as I’m concerned, in January 1965 at Columbia Records Studio A in New York City when he recorded Bringing It All Back Home. One side of the record was acoustic, the other side featured Bob on an electric guitar with a band. The record was released on March 22, 1965, and in late July of that year, with the release of Like a Rolling Stone, six-minutesplus of brooding lyrical verse dropped in a sea of three-minute love songs, he changed the way singles could and would be played on the radio. “The Bringing It All Back Home albumcover picture probably elicits more questions than any photograph I made. After hearing the music at the sessions, I realized that I needed to make a photographic statement that would herald the newly reinvented Bob Dylan. Albert Grossman’s House, Woodstock, January 1965. Everything with Bob got bigger. At the outset I had no idea that the pictures would include, among others, Joan Baez, Allen Ginsberg, Peter Yarrow, Odetta, Johnny Cash, Les Crane, and Albert and Sally Grossman. Or that after the now-legendary Forest Hills concert I would hide Bob under a blanket in a blue Ford station wagon, concealing him from an exuberant crowd in hot pursuit, while his road manager Victor Maymudes inched the car through the crowd. All in all there were about 30 photo sessions, starting with Woodstock, usually with little advance notice. Although I attended many Dylan concerts, and heard many of the songs again and again, the commitment with which he performed always gave them a new life. Sometimes I felt I was hearing and seeing a brand-new Bob Dylan. I was also seeing a brand-new me, for I had to remake myself from a mostly studio photographer to an I-can-shoot-anythinganywhere photographer who could make camera settings and change film in darkened theaters. I was shooting with 35mm cameras at a time when automation was rare. No autofocus, no motor advance, and, more important, no auto exposure. And one other small matter: I had to learn to shoot when the sound of the music or Bob’s voice would cover the click of the shutter and not when there was a breath or a space in Bob’s phrasing. The camera shutter was like a hammer blow in a quiet theater or recording studio designed to amplify and carry every sound. I was fortunate to be shooting during this special “big bang” year when Bob Dylan made two of his greatest albums, when he changed music and the music business, and when he went from a young man ready to go to someone who went all the way and then some. “He is continually compelling, inspiring, and wonderfully infuriating: the young man who can’t sit still for a portrait, the man who wants to do what feels right for him—not what is expected of him.” O’Henry’s Cafe, Greenwich Village, New York City, April 1965. “The traveling, the inconveniences, the waiting, the time spent and energy involved had one main objective: the concert. It created a feeling of urgency, as if to say there’s hardly enough time to get it all out.” On the way to a performance at Town Hall, Philadelphia, Pennsylvania, October 10, 1964. “Dylan made it clear that he wanted the pictures to come from the things he did, and not from things we would arrange for him to do.” Bernard’s Cafe Espresso, Woodstock, New York, August 27, 1964. “The day I first met Bob started with a two-hour drive to Woodstock, to the home of his manager Albert Grossman. I found him sitting in the kitchen reading a newspaper. He turned the pages of the paper and never acknowledged my presence.” Woodstock, New York, August 27, 1964.